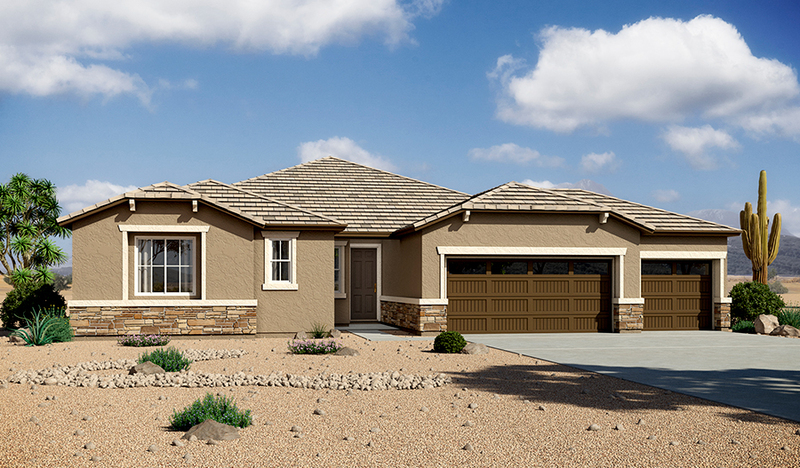 A paver-stone driveway and covered entry give this ranch-style model home abundant curb appeal. Inside, discover a study with built-in bookshelves, a spacious great room with multi-slide doors opening onto a covered patio, and a gourmet kitchen with 42" cabinets, quartz countertops, a center island, dual walk-in pantries and a nook with additional cabinets. The luxurious master suite features a tray ceiling, immense walk-in closet and deluxe bath with rain shower, and is separated from two additional bedrooms for privacy. You’ll also appreciate a teen room, 6" x 36" tile flooring and surround sound.